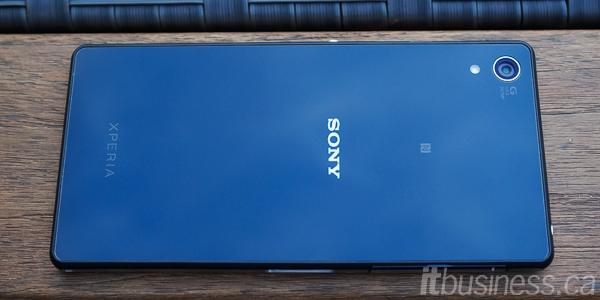 Sony’s Xperia Z2 is the third smartphone launched in its Z series of Android devices, after the Xperia Z and Z1. The Z series represents Sony’s flagship phones, and the original Z, released in early 2013, was the first Xperia that had almost purely Sony DNA after Sony Ericsson became Sony Mobile. 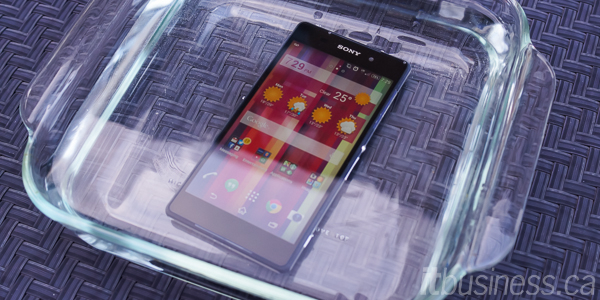 The Xperia Z was one of the first mainstream smartphones made available in Canada that was water-resistant, and featured Sony’s new Omni-Balance design, with an attractive glass back and rounded metal sides. Its successor, the Z1, was released in fall 2013 and featured a similar external design, but with better element protection, faster internal hardware and a better camera. While the Z1 was a good phone, it was, unfortunately, let down by its screen that had dull colours and poor viewing angles. With the release of the Z2 earlier this summer, Sony has addressed the Z1’s primary flaw and incorporated a vastly improved 5.2-inch Triluminos display that has much better viewing angles. Available from Bell Canada or directly from Sony, the Z2 is an attractive waterproof phone with excellent performance and long battery life and is a great choice for business users. Rear Camera 20.7 MP Sony IMX220 Exmor RS sensor with f/2.0 27 mm G Lens and LED flash. 4K video at 30 fps, 1080p video at 60 fps, HDR Video. 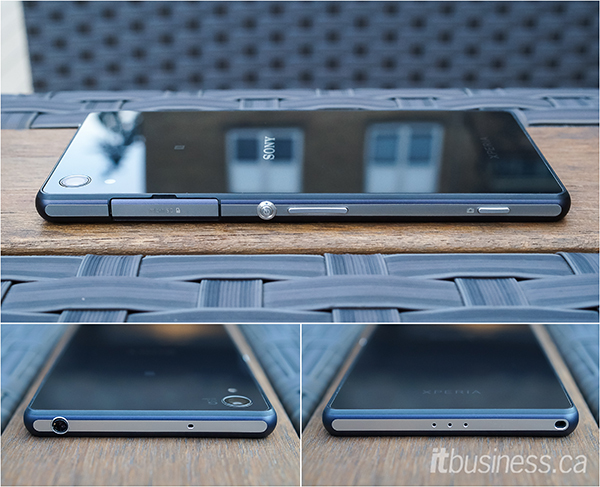 The Xperia Z2’s Omni-Balance design is quite attractive, but perhaps a tad too monolithic. With its glass back and rounded metal edges, there are few other Android phones that look like it. The Z2 is especially striking in purple, but this colour might be a little too bold for some business users. It is a pretty big phone, and while it does have a large 5.2-inch screen, which is approaching phablet territory, Sony could have perhaps still made the Z2 a little more compact without changing its screen size. Since there are no physical Android navigation buttons below the screen (the Z2 uses onscreen Android controls), perhaps the top and bottom bezels could have been a little narrower. However, one advantage of their size is that there was room for Sony to incorporate front-facing stereo speakers. Also, despite its size it is still fairly comfortable to hold due to the rounded edges, and its premium build quality and well distributed weight gives it a very solid feel in the hand. One aspect of the Z2’s design is its glass back. While it certainly makes the phone very attractive, it is a huge fingerprint magnet, and it is also not the most durable material. A glass back is likely to crack or shatter if the Z2 is dropped, so protecting it in a case is essential. Both the front and back of the Z2 use Dragontrail glass, a less commonly used scratch-resistant material similar to Gorilla Glass. Scratch-resistant is not scratch-proof though, so investing in a couple of screen-protectors is a good idea. The Z2’s glass-backed design is sealed up, so there is no removable battery. Thankfully, the battery that Sony equipped it with is a huge 3,200 mAh, so not being able to change it should not be a problem. 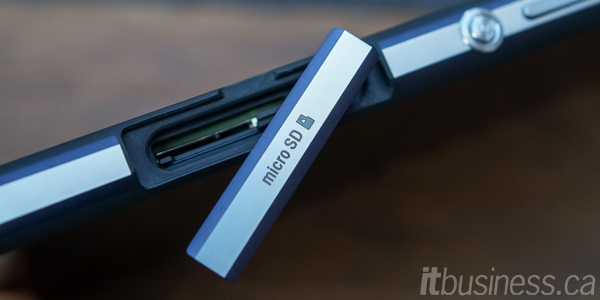 It does have a microSD slot on the right side of the phone, covered by a rubber-sealed door to keep out water. The SIM card slot and USB port on the left side are also covered by a flap. Having the USB port on the side of the phone rather than the bottom does make it a little awkward to use the Z2 if it is plugged in. However, if the port was on the bottom that would be an additional point of ingress for water that would have to be protected. One of the signature elements of the Z series design has been a circular metal power button half way down the right side, and it is still present on the Z2. It looks great and is well-placed for easy access when holding this large phone in one hand. However, the metal volume control rocker below the power button is a little too small and awkward to use since it sits a little too low. Further down the right side is a physical camera shutter button, something that is sadly missing from most smartphones. Not only does this button make it easy to quickly launch the camera and take a picture when the phone is locked, it also allows you to take pictures underwater, where the touchscreen does not work. Above the screen, the Z2 has multi-colour LED notification light that changes colour depending on what app has a waiting notification, for example, blue for a Facebook update, white for email, etc. While the colours are not customizable out of the box, you can download third-party apps to do this. Strangely, the Z2 does not have an IR blaster (so you cannot use it as a universal remote), even though most of its competitors have one. You would think it would be a natural fit since Sony makes TVs too. The Xperia Z2’s 5.2-inch screen is an IPS LCD display that uses Sony’s Triluminos technology to display a wider range of colours than traditional LCD screens. It is a big improvement over the screen in its predecessor, the Z1, with vibrant colours and much better viewing angles. 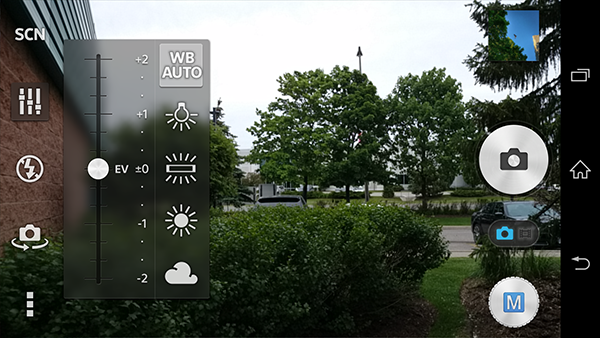 Sony has also added a couple of other features – one is glove mode, which increases the screen’s touch sensitivity so it can be used with gloves, handy for Canadians. The other is the X-Reality Engine technology used in Sony’s Bravia TV’s that increases contrast, colour saturation and sharpness, while reducing noise when viewing pictures and videos on the phone. As for the screen’s formal performance, it has a maximum brightness of 320 nits, which is a little low when compared to the output of its competitors like the Galaxy S5 and iPhone 6. This means that the Z2’s screen is not as easy to read when using it outside under bright light. Sometimes when using it in bright light, it catches a reflection, and you can see tiny dots in the glass that are part of the digitizer grid for the touchscreen. It is a minor issue, but still a little distracting at times when using the phone outdoors. Its Triluminos technology does mean that the screen has a wide sRGB colour gamut, so its colours are very bright and vibrant, similar to those of AMOLED screens. Overall the Z2’s screen is very good, and comparable in quality and performance (apart from its brightness) to the displays of other flagship phones. The Z2 has a 2.26 GHz Qualcomm Snapdragon 801 MSM 8974AB SoC (system-on-chip). While it is not the fastest variant of the 801 (there is also a 2.5 GHz AC version), it is still fast enough to give the Z2 excellent performance, as you’ll see in the benchmark results chart below. It is nice that the Z2 has 3 GB of RAM, since it helps with multitasking performance when you have a lot of apps open at once. Disappointingly Sony only decided to give it 16 GB of internal storage. Yes, the Z2 does have a microSD slot to add more memory, but internal storage is always better performing. The Z2 has NFC, like most current flagship phones, which can be used with contactless mobile payment systems and for quick syncing with wireless peripherals like Bluetooth speakers. The Z2 has front-facing stereo speakers, which sound very good, thanks to Sony’s ClearAudio+ technology. However, they are not as loud and room-filling as the stereo speakers of the HTC One M8, so are not as good for conference calls. The voice call quality was very good, and I had no issues making calls with the Z2 on Bell’s network. For data connectivity, the Z2 supports a huge amount of LTE bands – 10 bands in all, which is very impressive, meaning you should be able to get LTE connectivity in most parts of the world. This makes the Z2 a great smartphone choice for business users who travel overseas frequently. Since you can also buy it unlocked from Sony you can use it on any carrier, allowing you to use local SIM cards when travelling to save on roaming fees. As for speeds, it is theoretically as fast as 150 Mbps on the Bell or Rogers network, but the fastest I recorded when testing the phone on Bell was 64 Mbps. As you can see from the chart above the Z2’s performance is comparable to its main Android competition. Its system performance is a little slower than the Samsung Galaxy S5 and slightly faster than the HTC One M8, and its graphics performance is also in the middle. In the real world, however, the performance difference between all three Android flagships is not going to be noticeable. When you compare the Z2 to the older Nexus 5 and iPhone 5S, you can see that it is a noticeably faster device. As for battery life, despite having the biggest battery of all five phones in this chart, it was not able to beat the Galaxy S5 (probably because the Z2’s larger screen is more power-hungry). However, 16 hours of continuous use is nothing to sneeze at, and still allows a business user to easily get a full working day of use out of the Z2 without having to plug it in. While there are a few other Android phones that are water-resistant, such as the Galaxy S5 which we recently reviewed, the Z2 is one of the few phones that is waterproof. It is rated IP (ingress protection) 55 and IP58, which means it is dust-proof, can withstand ‘water jets’ (such as heavy rain) from any direction, and can be continuously submerged in up to three metres of water. The Z2 achieves this by sealing up the phone and having rubber-sealed doors covering its external ports – the microSD slot, SIM card slot and USB 2.0 port. While it is a bit of a pain to have to keep opening the door to access the ports, especially to charge the phone, it is worth it if it means you have a waterproof device. This level of protection from the elements makes the Z2 an ideal phone for business users always on the go. If you are running late for a meeting and it is pouring down with rain, you can take out your phone and read that important email without worrying if it will be damaged. Also, if you put the Z2 in a protective case, its dust and waterproofing makes it a good choice for business users who work in environments that require a rugged device. The Z2 features what is on paper the most impressive camera of any Android smartphone. It uses a 20.7 MP 1/2.3″ Sony IMX220 Exmor RS sensor, which is one of the highest resolution and physically largest sensors of any smartphone. It also has a very wide f/2.0 aperture and Sony G Lens, a class of lens usually only found on Sony’s higher-end cameras. On the software side, the Z2’s camera has a lot of settings and modes, giving you a lot of control and flexibility over how you take pictures with the phone. While the camera is capable of shooting at the advertised 20.7 MP, in most shooting modes the Z2 takes 8 MP images by down-sampling info from the full 20.7 MP sensor to the lower-resolution. This allows the Z2 to capture a lot of detail and perform well in low-light while still keeping the image file size manageable for easy sharing. However, if need be you can shoot picture at the full resolution in the camera’s Manual mode. Still, you’ll want to shoot in the oversampled 8 MP mode most of the time, since the different shooting modes and adjustments, like HDR, are only available when shooting at that resolution (and lower). Performance wise, as far as focus and image capture speed goes, the Z2 is fast, comparable to other current Android smartphones, but not quite as fast as class-leaders like the LG G3 and Galaxy S5. The Z2 has two levels of modes and settings. The overall modes, some of them shown above, include ones like Superior Auto, the primary shooting mode, Manual, and the usual suspects like the self-explanatory Sweep Panorama mode and Background Defocus mode, which applies DSLR like background blur to your images. For business users the Info-eye mode is quite useful, using image recognition to provide more information on what you see in the viewfinder — for example when traveling you can point the Z2 at a landmark, and it will recognize it and show you its location on Google Maps. Info-eye can also be used to scan barcodes, QR codes and scan and save contact info from business cards. The Superior Auto mode is very limiting as to what you can adjust, so if you do want to exert greater control how your pictures are shot, then you need to use Manual mode. 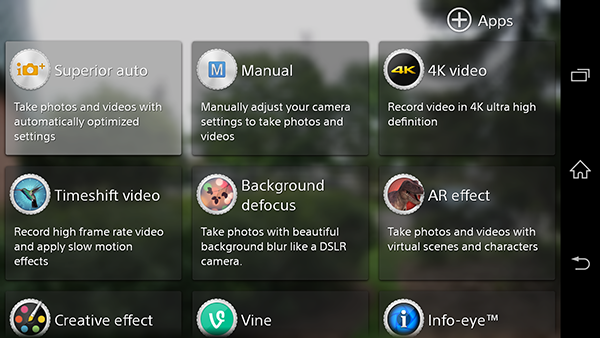 In this mode, there are more granular scene settings you can use, such as Landscape, Night scene, Sports, and you can also adjust additional things like exposure, white-balance and ISO. Manual mode is also where you can specify what resolution you want to shoot at. However, despite the fact that it is called Manual mode, the Z2 does not have controls for shutter speed and aperture. While it is hard to see without viewing the full-resolution image, the daylight picture above, taken with the Superior Auto mode, shows that the Z2 captures lots of detail. Its performance when shooting in good lighting conditions is very good, up there with the best smartphone cameras. 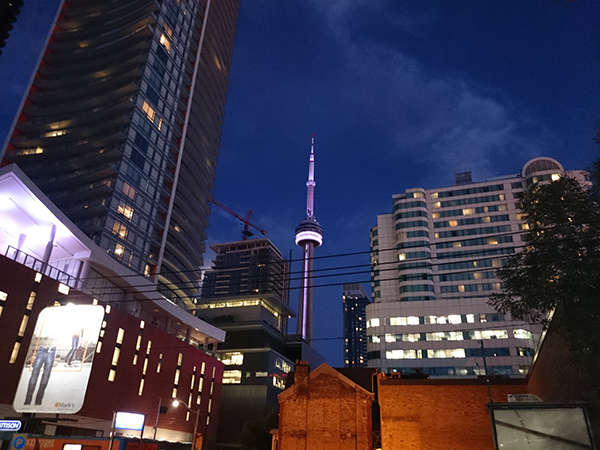 The night shot above was taken with Manual mode, and in low-light the Z2 is capable of producing very good results in this mode. However, if you use the Superior Auto mode in lower-light, the images come out unnaturally bright at the expense of detail, so we recommend you always use Manual mode at night. This unfortunately does mean that you also have to spend more time playing with the scene and exposure settings to get the best results, which is not always ideal if you just want to quickly take out the phone and capture a fleeting moment in low-light. Despite its specification superiority, abundance of modes and ability to take some very good pictures, the Z2’s camera has one glaring problem that impacts its usefulness. The Superior Auto mode has problems shooting scenes with a lot of dynamic range and at night. We often found that this ‘automatic’ mode did not function as advertised and produce ‘superior’ images without having to adjust any settings. For business users looking just to take a good picture with a minimal amount of fuss, this will be frustrating. 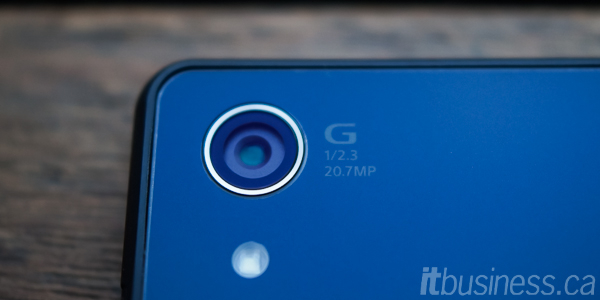 There are other Android phones with much better automatic modes, such as the LG G3. However, in Manual mode if you learn how the Z2’s camera works and get used to it, and are OK with changing settings, it IS capable of very good pictures. It just takes a little more effort. On the video side, the Z2 is 4K video capable. 4K is shot in a totally separate mode, rather than just being a resolution option in the normal video mode. 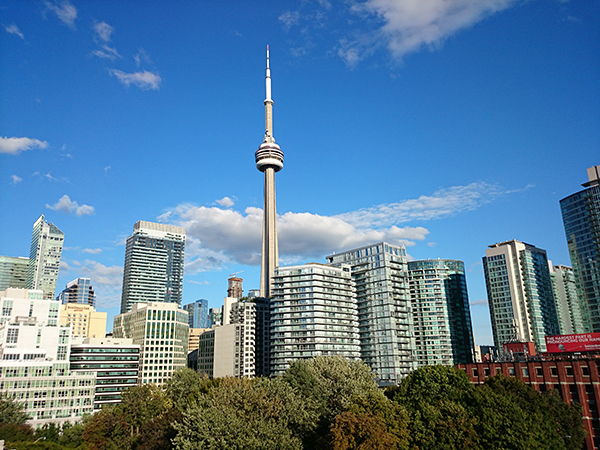 The 4K video quality from the Z2 is pretty good for a phone, but, of course, nowhere close to the output quality from a proper 4K capable video camera. Its 1080p video is also very good for a smartphone, and while the Z2 does not have optical image stabilization, its digital stabilization works very well when shooting video and keeps things nice and steady, even if you are moving the phone around while shooting. The Z2’s OS is built on top of Android KitKat 4.4.2 (though an update from Sony to the latest version, 4.4.4, is expected soon). 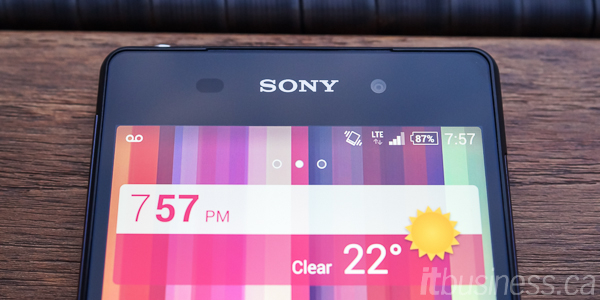 The Sony UI is very attractive, fast and fluid, and does not stray too far from the look and feel of stock Android, but still manages to have a uniquely Sony flavour, by incorporating a few additional tweaks and features. For example, in the app drawer you can swipe right to bring up a menu that lets you better sort your apps – by most used, alphabetically or your own custom order. Sony has also made their OS very visually customizable. There are a number of themes preinstalled on the Z2 that change the wallpaper, font colours and selection highlights to a matching colour scheme. Numerous Sony apps are pre-installed on the Z2, such as Walkman, which connects to Sony’s Music Unlimited service, Album, which connects to Sony’s Play Memories cloud photo storage service, and Movies, which connects to Sony’s Video Unlimited video store. They are all very attractive apps and Sony updates them frequently with fixes and new features, so if you are heavily invested in getting you entertainment media from Sony’s services, then the Z2 would be a good choice of phone. In the second screenshot above, you can see the Z2’s Small Apps, which are similar to LG’s QSlide apps. The shortcuts to these are found in the multitasking menu, and they are resizable floating windowed version of Chrome, Gmail, Calendar, Calculator and Timer that can be overlaid onto what you are working on. Unfortunately, unlike the Galaxy S5 and LG G3, the Z2 does not have a multi-window mode for side-by-side multitasking, something its 5.2-inch screen is more than big enough to accommodate. 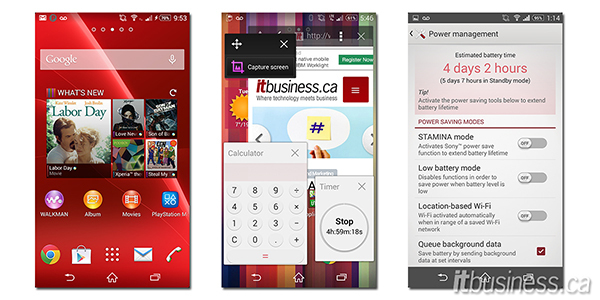 The third screenshot is of the Z2’s Power management options including Stamina mode, which is a customizable power-savings mode. When Stamina mode is on, mobile data and Wi-Fi is disabled when the screen is off, which will save a lot of power. However, if there are certain crucial apps, such as your work email, that always need to be connected you can set it, so they still get updates when the screen is off. 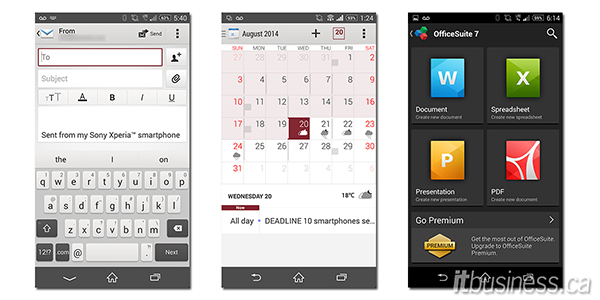 The Z2 comes with a standard suite of business app, such as Email, Calendar and Contacts. The Sony Email app is an attractive mail client for use with IMAP, POP or Exchange ActiveSync (EAS) email, and you can manage multiple email accounts in separate or a combined inbox. The Calendar app is nicely designed and shows the weather forecast on the calendar view, which is a nice touch. It also has a ‘smart search’ feature that lets you find appointments based on keywords in the body, subject or email address. The free version of Mobisystems OfficeSuite 7 is pre-installed on the Z2 for viewing and editing Word, Excel, PowerPoint and PDF documents. This free version does have some limitations, but it is sufficient for basic document creation. For more advanced document work you need to pay to get the premium version, which is a subscription starting at $3.26 a month. Of course, you do not have to use OfficeSuite – you can always install and use Google’s Docs, Sheets and Slides, or use Microsoft Office Mobile. The Z2 has the underlying security of Android KitKat, which is the most secure version of Google’s OS yet. Android 4.4 uses Security Enhanced (SE) Linux access control, and Android can now verify apps before installing them to check for any malware. Unfortunately, it does not come with any third-party security software, so business users would be advised to install one too for an additional layer of protection. The Z2 also offers full encryption with 256-bit AES for all user data in the internal memory and microSD card. For device security, in the event that the Z2 is either lost or stolen, there are a number of methods administrators and users can use to remotely wipe data from the phone. You can use EAS, Sony’s ‘my Xperia’ service, Google’s Android Device Manager or a third-party MDM (mobile device management) tool. The Sony my Xperia tool once activated on the phone allows you to go to myxperia.sonymobile.com to locate, and lock and wipe the Z2 if it is lost. For larger organizations who have a BYOD (bring your own device) and/or COPE (corporate owned, personally enabled) policy who need more advanced MDM functionality, the Z2 leverages both the native Android device management APIs and its own Sony Mobile APIs to allow administrators to manage the phone using third-party tools. You can use EMM (Enterprise mobility management) solutions by AirWatch, SOTI and MobileIron to enforce password policies, remove or disable applications, and disable phone features, such as being able to take screenshots. However, while the security and management features of the Z2 are a step up from what is found on many other Android phones, they are not as comprehensive or advanced as what can be found on the latest Samsung phones that support Samsung’s KNOX 2.0. The Z2 is a great choice for business users looking for a new Android smartphone. It is a nicely designed and well-made device that features an extra layer of protection that not many other phones have, namely that it is waterproof. It has a great looking big display, excellent performance and great battery-life. The attractive Sony OS on top of Android KitKat is fast and fluid, and the productivity applications that come with the phone work well. For enterprise users, the Z2 has many useful security and management features that make it a good choice as a BYOD device. The only aspect of the phone that needs work is its camera, which while technically impressive and capable of taking some very good pictures, needs a little too much work to produce them. 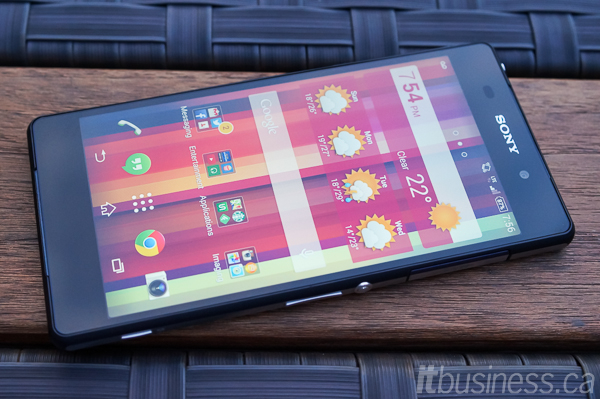 The Sony Xperia Z2 is available from Bell Mobility in white or black for $100 on a 2-year term, $700 outright. You can also buy an unlocked version directly from Sony in purple, white or black, for $700.